The Office of Personnel Management’s Acting Director Beth Cobert was nominated Tuesday to stay on as the agency’s permanent chief. 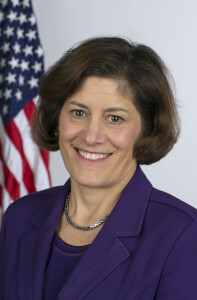 In a Nov. 10 statement, President Barack Obama said Cobert would bring a “tremendous depth and quality of experience” to the position, which she has held since July, when former OPM director Katherine Archuleta resigned. American Federation of Government Employees National President J. David Cox Sr., in a statement congratulated Cobert, saying she had done “an admirable job” as acting director. “She has answered questions about the data breach honestly, has taken steps to bring in-house the work associated with notifying affected employees, and seems to understand IT adequately enough to make sure that security measures are in place to minimize further breaches,” Cox said. Cobert also serves as deputy director for management at the Office of Management and Budget. She joined OMB in October 2013 after a 29-year career as a consultant for McKinsey and Co.
Cobert stepped into her role one day after OPM announced that more than 21 million people had been impacted by a data hack. Since leading OPM, Cobert has found support from congressional members, including Rep. Mark Meadows (R-N.C.), chairman of the House Oversight and Government Reform Subcommittee on Government Operations, who told Federal News Radio he was pleasantly surprised at Cobert’s outreach efforts. “It’s very rare in Washington, D.C., to see not only a proactive approach, reaching out to members of Congress on both sides of the aisle, but really a dedication to the federal workforce that came across in her energy, her tenacity, her willingness to ask the tough questions, but more importantly, find a real solution,” Meadows said. Rep. Jason Chaffetz (R-Utah), chairman of the House Committee on Oversight and Government Reform, issued a statement saying that he was hopeful Cobert could fix OPM. Republican lawmakers sent a letter to Obama in July calling for the removal of both Archuleta and Seymour. In the aftermath of Archuleta’s resignation, Chafettz has continued to press for Seymour’s removal. Rep. Elijah E. Cummings (D-Md. ), the ranking member on the House Oversight Committee, issued a press release praising Cobert’s work as OPM’s acting director, saying she was the right person for the job. Sen. Tom Carper (D-Md. ), the ranking member of the Homeland Security and Government Affairs Committee, said in a statement that it’s critical for OPM to continue to help the millions of victims of the two cyber breaches. He also called on Congress to provide agencies with the necessary tools to protect their systems from cyber attacks.